More specifically, one of the tools which is functioning on-board this research rover lander happens to be an incredibly highly sensitive seismometer which was designed for picking up internal activity from within the planet’s core. However, a very neat and separate application of this highly sensitive seismometer has been the unique application of using it to recently observe and analyze the progression of air streams (i.e., wind) moving past the rover lander’s recent position. This was detected as a result of the Martian winds blowing past the rover lander’s solar panels and then having the minor movements applied to the rover lander being identified as Martian wind. The recording of this recent Martian wind which was observed is attached in the Tweet which is linked above (courtesy of the NASA Insight and NASA JPL Twitter accounts). This is neat since it just goes to show how there can be minor temperature and pressure gradients across various parts of Mars which could cause occasional breezes (i.e., something akin to what is found on Earth on a calm, sunny day). To learn more about this Mars rover research mission in even greater detail, click here! To learn more about other interesting space weather topics from the Global Weather and Climate Center, click here! An icy sunrise peaks over the Manzano Mountains in Albuquerque, NM on February 21, 2017. Northern lights lit up the night sky over Mendenhall Glacier in Juneau, Alaska shortly after 4 am, November 2017. 30,000 years ago, early humans in France illustrated natural lights in the sky through cave paintings. The Inuit of Alaska believed that the lights were the spirits of animals they hunted. As early as the 1600’s, Galileo Galilei used the name “aurora borealis” to describe the phenomenon, after the mythical Roman goddess of dawn, Aurora, and the Greek name for the wind of the north, Boreas. Particles may escape the sun from sunspot regions on its surface, sending charged particles into space and toward Earth (known as the solar wind). These particles interact with the Earth’s magnetic field and are funneled toward the poles, where they set off colorful displays of light (aurora borealis in the Northern Hemisphere or aurora australis in the Southern Hemisphere). 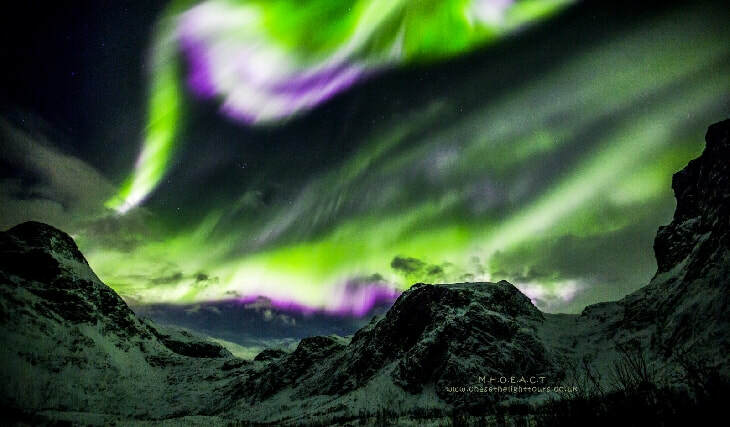 Auroras can come in a variety of colors from pink, green, blue, violet, white, and most commonly green. Green lights are produced when particles collide with oxygen and may appear above 150 miles of the surface. They can be seen in arcs, rays, streamers, bands, or rippling curtains. Auroras are even thought to make sounds similar to radio static or hissing during strong displays due to charged particles that rapidly discharge (like static electricity) when they slam into the Earth’s atmosphere. Magnetometers around the world constantly measure the effect of the solar wind on Earth’s magnetic field and give an indication of auroral activity up to 30 minutes in advance. In order to know your chances of seeing an aurora, the Kp index (from German “Kennziffer Planetarische” or “planetary index number”) gives a range of auroral activity on a scale of 0 to 9 for a 3-hour period. Anything above a Kp5 indicates a geomagnetic storm, which can interfere with GPS signals and even the electrical grid. When geomagnetic activity is low (Kp1-2), auroras are typically located around 66 degrees magnetic latitude and may expand toward the equator as activity increases. 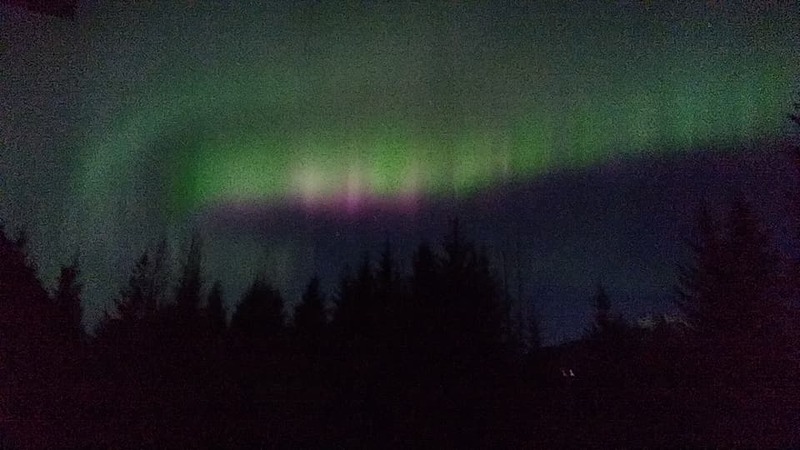 To see the Northern Lights in parts of southern Canada and southeastern Alaska, generally a Kp3 level is needed and anything greater than Kp6 for the Boston area to have a chance of seeing this amazing light show. (Winter is usually the best time to see them, due to lower levels of light pollution and the clear, crisp air). The Kp forecast for the rest of this week shows low auroral activity (Kp2-3), with a high chance of auroral activity to kick off the week. To learn about space weather forecasts, please click here! 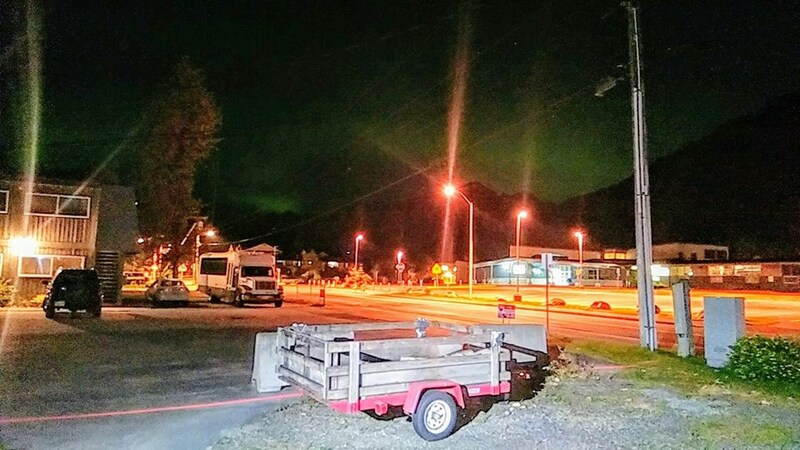 Northern lights over Juneau, AK, September 2018. ​On February 12th, sunspot AR2699, which had recently morphed into four individual spots, exploded, producing a C1-class solar flare in addition to hurling a coronal mass ejection almost exactly in the direction of Earth. The sunspots' rapid change in appearance was a significant clue that its magnetic field was changing, a process that can lead to solar flares when the magnetic field twists, turns, and magnetically reconnects to restore equilibrium. 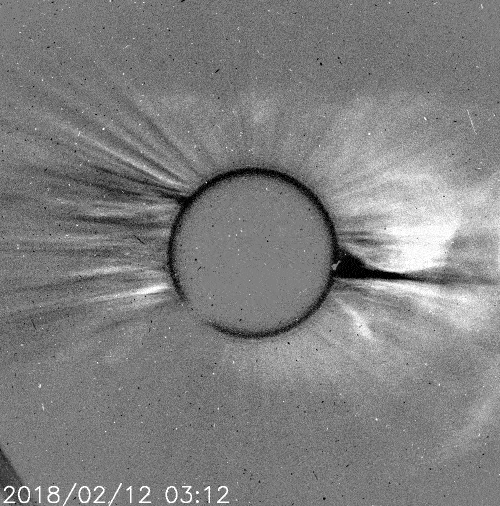 Coronal mass ejection models at NASA and NOAA currently disagree with the timing for when the solar material will impact Earth; the coronal mass ejection could arrive as early as late on February 14th, but is more likely on February 15th. The coronal mass ejection may be strengthened by a stream of fast moving solar wind particles that was already en route to Earth when the sunspot exploded; if the CME sweeps up material from the stream, much like a snowplow, it may increase the potency of the solar storm when it strikes Earth's magnetic field. A G1 (minor) geomagentic storm watch is in effect for February 15th. Arctic sky watchers should be alert for auroras when the CME arrives; if the storm intensifies to class G2, observers in Canada and northern U.S. states may have a chance to see auroras as well. DISCUSSION: Although captured in December 2017, NASA has now released images of the farthest photos ever taken from Earth by a spacecraft. The New Horizons LORRI (Long Range Reconnaissance Imager) captured false-color images of Objects 2012 HZ84 (left) and 2012 HE85 (right) in the Kuiper Belt. The Kuiper Belt is a region located beyond the orbit of Neptune with asteroids, comets and other bodies made of mostly ice. On December 5, 2017, the spacecraft snapped the images just over 3.79 billion miles (6.12 billion kilometers) from the Kuiper Belt objects. To put it into perspective, the Earth is located about 93 million miles (150 million kilometers) from the Sun. The photo surpassed the “Pale Blue Dot” images of Earth taken in 1990 by Voyager 1. The New Horizons flew past Pluto back in 2015 and is on course to fly by another icy body in the Kuiper Belt at the outer reaches of the solar system in January 2019. After being launched in 2006, the New Horizons has fully lived up to its expectations. Although currently in electronic hibernation, the spacecraft will be reawakened in June 2018 by flight controllers in a lab in Johns Hopkins University in Laurel, Maryland. It will continue to glide during its preparation for its visit with 2014 MU69 in the Kuiper Belt. Check out this link to read more about this historic event. To learn more about space-weather related stories, click here! DISCUSSION: On Tuesday February 6, 2018, SpaceX launched the first Falcon Heavy rocket from Cape Canaveral, Florida. The Falcon Heavy is a modified form of the Falcon 9 with two additional Falcon 9 first stages as boosters to provide more power to the rocket. This enables the Falcon Heavy to be able to carry heavier loads and be able to go to the Moon in future missions. This launch is a test to see what the Falcon Heavy can do outside of tests as well as being a stepping stone in commercial spaceflights to the Moon and beyond. The payload for this first launch is Elon Musk’s, the founder of SpaceX and Tesla, personal Tesla roadster which will be in an orbit of the Sun that is similar in size to the planet Mars’ orbit. The rocket will be used to help meteorologists in the future as it is projected to take several satellites including the Formosat-7/COSMIC-2 which will study optical effects in the upper atmosphere in June of 2018. Conditions for the launch at Cape Canaveral in Florida were good at the time of the launch window at 1830Z (1:30 pm EST) and remained the same through the launch which occurred at 2045Z (3:45 pm EST). In addition, the Convective Available Potential Energy (CAPE), which is the maximum buoyancy of a parcel relative to the strength of upward motion, was very minimal and not able to be enough to generate any thunderstorms near the rocket launch. However, some clouds at about 2300 ft were observed but were not a major factor. Clouds generally are a concern due to historical lightning strikes involving rocket launches even when there are non-convective clouds aloft. An example of this is Apollo 12 back in 1969, when lightning struck the Saturn V rocket carrying the Apollo spacecraft a minute into the flight despite there being no convective clouds at the time. 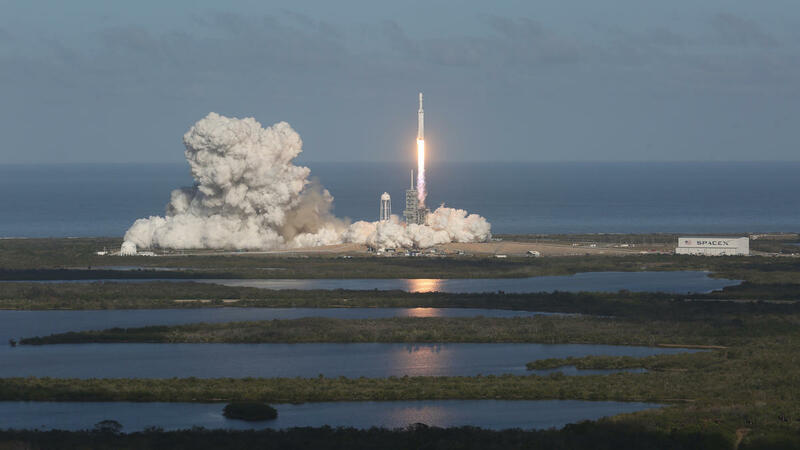 There was a southeasterly wind between 5 and 10 knots near the surface with westerly winds aloft which helped the Falcon Heavy pitch to its desired angle of attack as it streaked through the atmosphere and into orbit. Weather conditions remained the same as the two boosters of the Falcon Heavy safely landed back at Cape Canaveral a few minutes after launch. Click here for more space news! DISCUSSION: On January 31, 2018, the next total lunar eclipse is expected to occur. This has significance because this comes at a time when the moon will be “super” and “blue” (particularly for parts of Asia and the Pacific Rim). A “supermoon” is when there is a full moon and is closest to Earth in its elliptical orbit, giving it a larger and brighter appearance than normal. A “blue moon” refers to when two full moons occur in a single month. At the time of a total lunar eclipse, the Earth casts its shadow over the moon. However, the moon will still be visible because of light refracted through the Earth’s atmosphere, giving it a reddish color. People in places like Taiwan and the United Arab Emirates are excited since the countries lie in optimal viewing locations, and this package of lunar phenomena hasn’t occurred since the early 1900s. Other lucky viewing locations include the Philippines, New Zealand, Russia, Japan, China, Korea, Mongolia, and most of Australia and Indonesia. Those in North America may still be able to salvage from the eclipse. Areas west of the Mississippi have the best chance of viewing at least a partial eclipse. The areas that have the best chance of viewing a total eclipse include Hawaii, Alaska, Yukon, the Northwest Territories, most of British Columbia, parts of Nunavut and northwest Washington. Unfortunately for the rest of those not in a location to view the cosmic show, they must wait until January 20, 2019 for the next total lunar eclipse. Click here to learn more about January’s Total Lunar Eclipse. CLICK ABOVE FOR VIDEO: Beginning on January 6th, NASA's Solar Dynamics Observatory caught an incredible solar prominence: a large, bright gaseous feature of cooler plasma anchored to the solar surface. 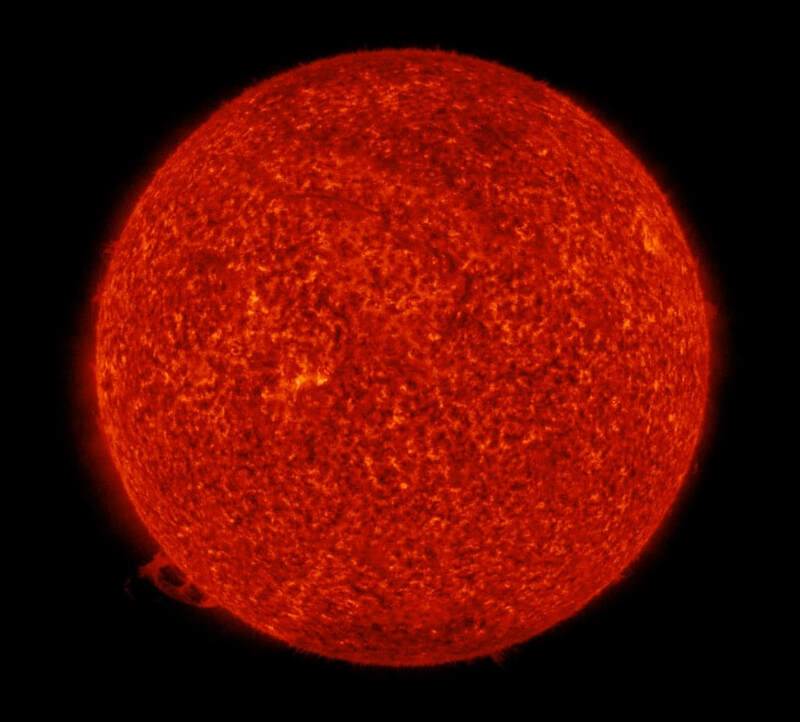 In order to see such a prominence, which is often in a loop shape, the Sun was viewed in light at 304 Angstroms to see the light emitted from the chromosphere, the middle layer of the Sun's atmosphere. 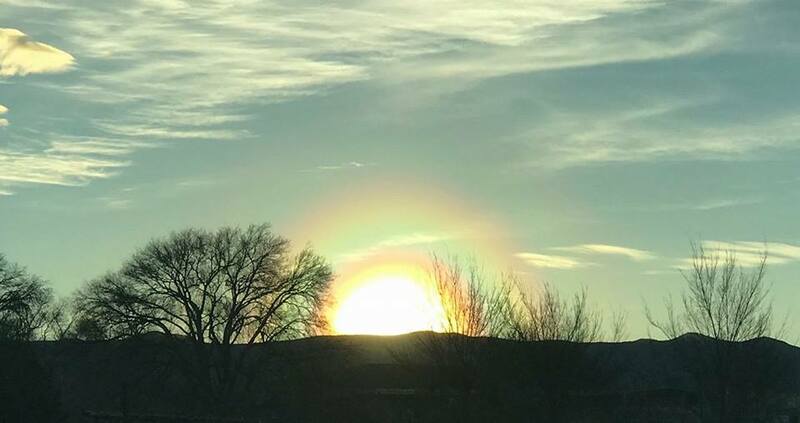 This wavelength captures light that is emitted from the chromosphere and transition region of the Sun's atmosphere by He II at about 50,000 Kelvin. Just as a rough estimate, this prominence, which started on the southeast limb of the Sun, probably extended about 100,000 kilometers or so (nearly eight Earth diameters!) into the Sun's outer atmosphere, called the corona, before collapsing on about 8:00 pm EST on January 7th. The current Earth's facing solar disk appears to be quiet as we headed into solar minimum: there is no major risk for solar flares or increased levels of solar energetic particles at this time.